We had originally sat down in The Garrick’s Head by the Theatre Royal Bath on Saturday lunch time but with no sign of service and curtain up fast approaching next door for the play God of Carnage we left thinking a packet of crisps and sandwich from Sainsbury’s would have to do. However a few doors up from the usually excellent Garrick’s Head was Pintxo. It’s a tapas and sherry restaurant come bar with branches in Cornwall and Bristol. We had no idea what it would be like and so went in and asked how long would it take to get served as the clock was ticking. We were assured of quick service so took a corner table in an interior that feature wood and muted earthen colours. Having experienced the rip-off tourist tapas bars of Barcelona we were not unnaturally rather hesitant and so chose the offerings on the specials board. I had an Amontillado sherry served in a tumbler and Linda had an Elderflower presse. A jug of iced tap was placed on the table without having to ask and the food arrived within a few minutes. 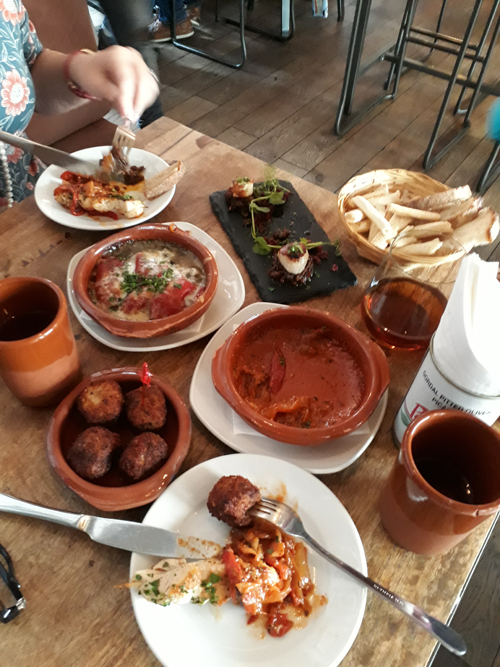 I have to confess to not making a note of the selection – but it featured skewered chicken, hot peppers, meatballs and a type of peperonata – and I’m sure mushrooms and melted cheese were in there somewhere – or at least that was the gist of it. The selection was fine. Hot, tasty and above all they came in quantities that made you think they were not scrimping. The sherry was nutty, warming, richly dark, agreeably dry and a generous 75cl in volume. And set me up for the play about couples falling out. The place was about half full but had a healthy vibe with families and couples and I must report clean toilets – one of my concerns as they can say so much about how a place is run. The dishes were around six or seven pounds a go so with sherry and drinks the bill came to £40. Expensive but as a one off pre-theatre meal I was happy with as so often eating out can be just so-so in quality. And you can often you think you could do much better yourself at home. But at Pintxo I thought as a wedding anniversary treat it was about right and unlike the couples in God of Carnage we didn’t fall out over the food or the bill. Reviewed at the Saturday lunchtime, September 15th, 2018. Follow Harry on Twitter @HarryTheSpiv, Instagram, Pinterest and Facebook for more stuff. I’m not sure how Jules, Lou and Sally do it. Their kitchen is tiny, they have to move large amounts of antiques to fit the diners in and they have to serve the food at speed with the minimum of fuss. A lot of restaurants fail to achieve the standards they manage with their pop up bistro but then I guess they have just the one menu consisting of four courses which must help. 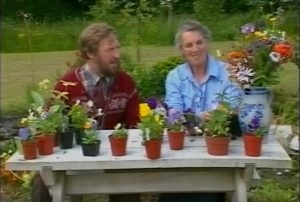 Set in their antique shop on The Square in Axbridge the evening is a delight. For £25 we are served with a starter, main, dessert and cheese and biscuits. The ambiance is possibly the best you can get as everyone is friendly, many residents know each other and there’s the sense this is being a special occasion. Next was Jule’s fish masala featuring husk, cod, king prawns all apparently fresh from Brixham harbour. Marinated in a rich home-made curry sauce and served with pilau rice infused with saffron we all knew we were being spoiled. Some had seconds while others having scoffed their course popped out for a cigarette or a vape. 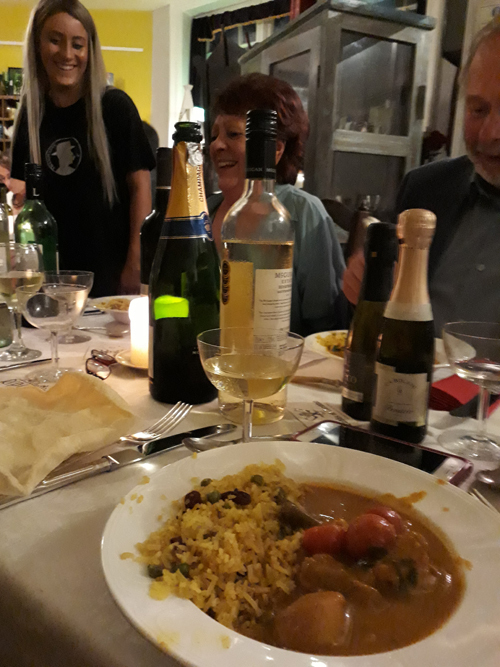 A great night out for Axbridge residents – look out for the next one in October – see their Facebook site – and don’t forget Axbridge’s charity Progressive Supper on Saturday, November 17th, 2018. 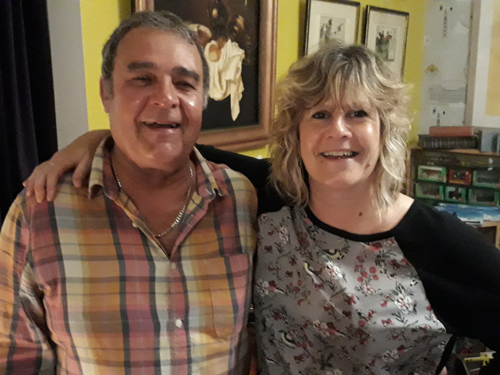 It’s a chance to meet lots of people, eat at three locations in one evening and raise money for the 2020 Pageant held over the August bank holiday – see the event’s Facebook site for updates and when to register. Reviewed at the Saturday evening, September 15th, 2018.